At a ceremony held at the Prime Minister’s House, Prime Minister Nawaz Sharif and Chinese President Xi Jinping on Monday performed the ground‑breaking of five major energy projects, signing 51 agreements and memorandums of understanding (MoUs) for Pakistan-China Economic Corridor and all round cooperation. Both the leaders witnessed signing of the MoUs by the ministers and senior officials of the two countries. On this occasion, the two leaders also inaugurated several projects by unveiling the plaques. Joint Statement between China and Pakistan on establishing the all-weather strategic cooperative partnership. 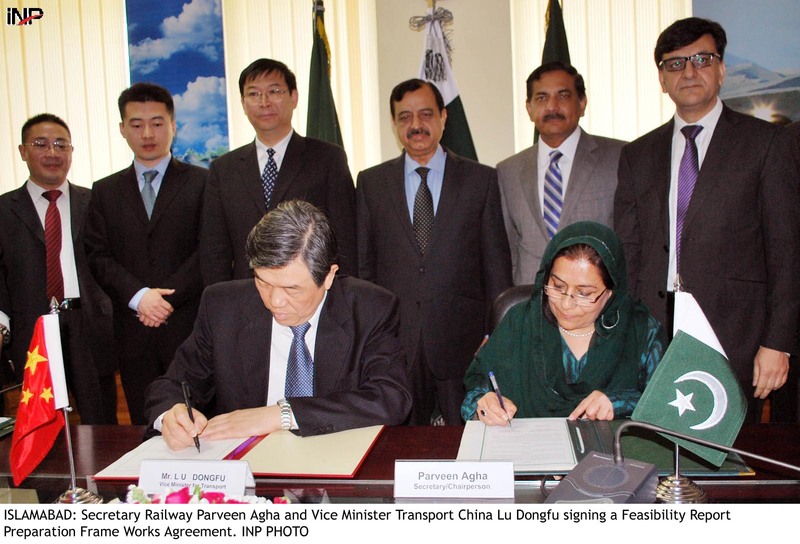 Exchange of notes of feasibility study of the demonstration project of the DTMB between China and Pakistan. Exchange of notes on provision of anti-narcotics equipment between China and Pakistan. Exchange of notes on provision of law enforcement equipment between China and Pakistan. Exchange of Notes on Feasibility Study of Gwadar Hospital between China and Pakistan. MoU on provision of Chinese governmental concessional loan for second phase up-gradation of Karakorum Highway (Havelian to Thakot) between Chinese Ministry of Commerce and Pakistan’s Ministry of Finance and Economic Affairs. MoU on provision of Chinese governmental concessional loan for Karachi-Lahore Motorway (Multan to Sukkur) between Chinese Ministry of Commerce and Pakistan’s Ministry of Finance and Economic Affairs. MoU on provision of Chinese governmental concessional loan for Gwadar Port East Bay Expressway Project between Chinese Ministry of Commerce and Pakistan’s Ministry of Finance and Economic Affairs. MoU on provision of Chinese governmental concessional loan for Gwadar International Airport between Chinese Ministry of Commerce and Pakistan’s Ministry of Finance and Economic Affairs. Protocol on Banking Services to Agreement on Trade in Services between Pakistan and China. MoU on provision of Material for Tackling Climate Change between National Development and Reform Commission of the People’s Republic of China and Ministry of Finance (EAD) of Pakistan. Framework Agreement on Cooperation on Major Communications Infrastructure Project between China and Pakistan. MoU on cooperation between Chinese NDRC and Pakistan’s Ministry of Planning, Development and Reforms. MoU on Pro Bono Projects in the Port of Gwadar Region between Ministry for Planning, Development and Reforms of Pakistan and the International Department of the Central Committee of the Communist Party of China. MoU on establishment of China-Pakistan Joint Cotton Bio-Tech Laboratory between the Ministry of Science and Technology of China and Ministry of Science and Technology of Pakistan. Framework Agreement between the Chinese National Railway Administration and Pakistan’s Ministry of Railways on Joint Feasibility Study for up-gradation of ML1 and Establishment of Havelain Dry Port of Pakistan Railways. Protocol on the Establishment of China-Pakistan Joint Marine Research Center between State Oceanic Administration of China and Ministry of Science and Technology of Pakistan. Protocol on establishment of sister cities relationship between Chengdu city Sichuan Province of PRC and Lahore. Protocol on establishment of sister cities relationship between Zhuhai, Guangdong, China and Gwadar, Balochistan, Pakistan. Protocol on establishment of sister cities relationship between Karamay, XianjianUgur, autonomous region China and Gwadar, Balochistan, Pakistan. Terms and conditions in favour of Sindh Engro Coal Mining Company for Thar Block II 3.8Mt/a mining project, Sindh, Pakistan, arranged by China Development Bank Corporation. Terms and conditions in favour of Engro Powergen Thar (Private) Limited, Sindh, Pakistan for Thar Block II 2x330MW Coal Fired Power Project, arranged by China Development Bank Corporation. Energy strategic cooperation framework agreement between Punjab, Pakistan and China’s Huaneng Group. Agreement on Port Qasim coal fired power plant between Power China and GoP. Energization of 100 MW solar power plants at Quad-e-Azam Solar Park, Bahawalpur. China-Pakistan Joint Research Centre for Small Hydropower, Islamabad. China-Pakistan cross-border optical fibre cable system project. I am Proud of CHINA…. Rise of Pakistan begins from this point. How many projects for (Karachi) SINDH? which is the biggest revenue generator for Pakistan. Pakistan China Friendship is the Biggest Problem for India and USA am i right? yeah you are right Pakistan China Friendship is the Biggest Problem for India and USA because china make every thing and very low cost ….